The Foreign Affairs Ministry on Thursday said it had withdrawn an article by Russia's foreign minister scheduled for publication in an influential American foreign policy magazine and accused the editors of censorship. The ministry said in a statement that Foreign Minister Sergey Lavrov had canceled plans to publish the piece in the journal Foreign Affairs, published by the U.S. Council on Foreign Relations. It said Lavrov's article on U.S.-Russia relations had been cut substantially and revised to the point of distorting and censoring his views. James Hoge, editor of Foreign Affairs, called the charges "utterly erroneous." In a statement, he said that that Lavrov's article went through the normal editing process, and that Russia's chief diplomat asked to pull his piece from an upcoming edition without explanation. 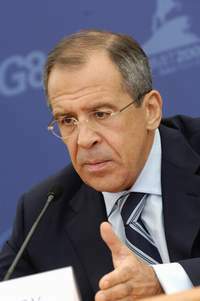 Hoge said Lavrov was allowed to revise his article after the magazine's deadline following the summit between President Vladimir Putin and U.S. President George W. Bush in Kennebunkport, Maine, in early July. The foreign ministry said Lavrov submitted the article in May in response to Yulia Tymoshenko, a pro-Western politician and former Ukrainian prime minister, who published an article in Foreign Affairs in April. Tymoshenko wrote that Western nations should work together to oppose Russia's alleged ambitions to re-establish political influence across the former Soviet Union. She compared her proposal to Washington's policy of containment during the Soviet era. "The Russia that emerged from the collapse of the Soviet Union on Christmas Day 1991 came with borders that reflect no historical precedent," Tymoshenko wrote. "Accordingly, Russia is devoting much of its energy to restoring political influence in, if not control of, its lost empire." Lavrov's article, posted on the Kremlin Web site, says at one point: "A return to Cold War theories such as containment will only lead to confrontation." According to the Foreign Ministry statement, Foreign Affairs' editors cut the article by 40 percent, "sanitized" it in ways that distorted its meaning and insisted on a sub-headline that raised the possibility of a new Cold War. "As a matter of fact, such a subtitle fundamentally runs counter to the key idea of the Russian Minister's article," the ministry said. "Since in Moscow we assume that no new Cold War ... between our two nations is possible." "This tough experience was reminiscent of the worst periods of the Soviet censorship past, which it appears some in the U.S. would like to repeat." The Council on Foreign Relations identifies itself as a non-governmental organization. Censorship normally implies government interference. Hoge said his magazine had suggested sub-headlines for the article but made it clear that Lavrov could word it as he wished.